The Book Bond: Boyd: "I don’t think they’ll ever make a retro Bond." 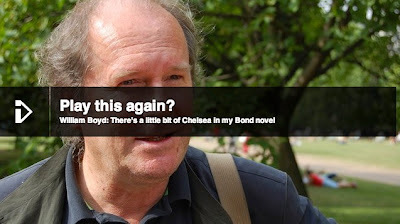 Boyd: "I don’t think they’ll ever make a retro Bond." Taking a schizoid shift of my own I decide to move the conversation on from eighteenth century Russia to make a last ditch appeal for more information about James Bond. Indicating with an uncomfortable glance at the window that snipers might be trailing us from across the street Boyd gives a wry laugh. He tells me there is a joined up 007 PR machine covering both the film and publishing empire that “has begun the drip-feed of information” that he can’t interfere with. But he is clear about one thing: his novel is not being lined up as the basis for a follow-up to Skyfall, the most successful Bond film to date having taken a record £100m at the UK box office, or any other of the spy movie. “I don’t think they’ll ever make a retro Bond. Even Dr No which was written in 1955 was set in 1962 when the film was made. All the Bond films from then have been completely contemporary. They wouldn’t go back and make a Bond set in 1969. It would throw the whole franchise askew,” he said. This is a great shame as Daniel Craig, whom Boyd is friends with, will be 45 in March, the exact age of Boyd’s Bond who follows Fleming’s detailed chronology. Much as we might love a period drama it wouldn’t make sense to cast Craig back, Life On Mars-style, five decades, Boyd insists mentioning the gadgets, cars and styles of the day that have come to define each cinematic installment. *Self congratulates himself despite that joke having just celebrated its 1,000,000th public airing.